In the late 1980s, the Swedish journal for paranormal investigation (Sökaren) published a report on the Committee to Investigate Miracles and other Verifiable Superstitions of Bangalore University under Dr. H. Narasimhaiah. A "Committee to Investigate Miracles and other Verifiable Superstitions" exists in India. The Committee's choice of is straightforward in that it does not regard its work as being without assumptions since it makes clear that it regards miracles as superstition. 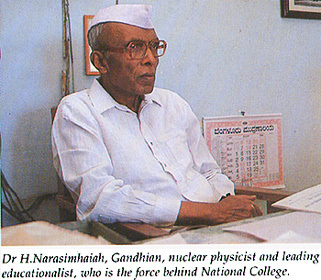 The Committee's Chairman is Dr H. Narasimhaiah, long known for his negative statements about miracles. In the book "Science, Non-science and the Paranormal" by various authors, Dr. H. Narasimhaiah (former Vice Chancellor of Bangalore University) wrote a chapter on the investigation of miracles. 'There is a world-wide belief in miracles and especially in India', writes Dr Narasimhaiah. and he defined a miracles as a phenomenon that goes against the known laws of nature. was founded in 1976 and was attached to Bangalore University, from where it received funds. It had 11 members. From the start is was made clear that the Committee was not against God or any religion. The Committee began its activity by investigating claims of the materialization of objects. Two swamis who were attributed such powers, openly declared that they never at all performed any miracles. But a "teenage god" who turned up in Bangalore, Sri Shiva Bala Yogi, invited dr Narasimhaiah to visit him. During the talks he made some movements with a hand under his ochre coloured robe and thereafter a sudden movement with his hand in the air and gave dr Narasimhaiah a small photos and a "rudrakshi" (note: seed of a tree regarded as holy in India). After the exposure of Sai Krishna, the Committee naturally directed its interest to Sai Baba, who was attributed such miracles as the materialisation of watches, images of Gods, gold chains and the transformation of water into petrol and the healing of many chronically ill persons. Sai Baba was regarded by his believers to be a god or a human divinity. He is know nationally and internationally for his miracles. Among his disciples were many with high positions in society and some well-known scientists. Dr. Narasimhaiah wrote three letters to Sai Baba requesting that he may investigate his miracles. Dear Swami, as you know a large number of people in our country claim that you possess miraculous powers" wrote Narasimhaiah in his letter. He went on to write that these people said he could create objects from nothing. "I am convinced that you will agree with me that materialisation of objects from nothing is a paranormal phenomenon that defies all known scientific laws. Indeed, all the scientific discoveries and investigations hitherto made throughout the world appear as insignificant in comparison to these phenomena. Many of us have quite naturally given a large amount of serious thought to these supernatural phenomena. Besides, our country is full of much superstition and we are very concerned about the injurious effect this has on people!" "The charisma that exists around you is built upon the belief that you can perform miracles. You know that, as soon as your miracles are proved a myth, you will become an ordinary person. Therefore it is evident logically that the best you have been able to do is avoid everything that can remove your halo." Dr. Narasimhaiah also wrote in the letter that is is not difficult to mislead or deceive many people but no one can deceive their own conscience. Since Sai Baba did not answer any of the three letters, dr. Narasimhaia turned to the press and exposed the content of the letters. A comprehensive debate arose in indian newspapers and journals. Many interviewed both Dr. Narasimhaia and Sai Baba. Narasimhaia wrote that Sai Baba poured scorn and poison over him, questioned his competence to investigate him and described him as a worthless, insignificant wretch who was too immature to grasp his (Sai Baba's) divine powers. In a speech Sai Baba called the members of the investigative committee insects. He compared himself to a star and an infinite ocean.He directed complaints at Bangalore University and advised them not to poke their noses into matters that did not concern them. He explained that there was no one on earth who had the capacity to investigate him. Dr. Narasimhaiah informs that a number of articles were written in papers and journals defending Sai Baba, but he mentions nothing of what they contained, other than that they extolled Sai Baba as God and attributed all kinds of divine powers to him. Yet another letter was sent to Sai Baba. He was invited to hold a lecture on "miracles" with a demonstration at Bangalore University. This letter was not answered either. The Committee finally decided to write to him and tell that they intended to meet him at 10 o'clock in the morning the 27th of May, 1977 at his residence. All the members of the committee together with representatives of the press sat in a bus and drove to Whitefield, where Sai Baba was living. When they arrived they were stopped from entering Sai Baba's area by guards. They had to return with their task unfulfilled. Dr. Narasimhaiah wrote that the conflict about Sai Baba's credibility continued for almost 18 months and made many begin to think. From then on doubts were sown even among Sai Baba's closest disciples. Sai Baba's influence has been reduced now; he has nearly ceased to perform 'miracles' and has withdrawn, writes Dr. Narasimhaiah. That the last statement no longer applies today is obvious. Sai Baba came unharmed through the battle with the investigating committee twelve years ago. How the Committee has fared I do not know. Dr. Narasimhaiah's report really says nothing. Sai Baba denied permission to be investigated. It may depend on a natural suspicion about the Committee or against scientists or that he has something to hide. But Erlendur Haraldsson published studies (as in Sökaren # 8, 1987) must be regarded as weighing more than the Indian Committee's dispute with Sai Baba. I have also read an article on Sai Baba in the Anthropological Quarterly 53 (3) 1983. The author, Lawrence A Babb, emphasizes how important Sai Baba's miracles were. Sai Baba is known above all for his miracles The miracles have an absolutely decisive significance for the cult around him. Without them he would not have been great, since his teaching is common Indian religious doctrine, without originality. 1. The Publisher is The Bangalore Science Forum, The National College Buildings, Bangalore, 560004 India. I do not know the publication date as I only have photocopies of some pages from it. för undersökning av mirakler och annan bevislig vidskepelse. Kommittén är med sitt val av namn egendomligt uppriktig i det den markerar att den inte avser att arbeta förutsättningslöst, utan på förhand betecknar bland annat mirakler som övertro. Kommitténs ordförande, dr H. Narasimhaiah. har länge varit känd för sina negativa uttalanden om mirakler. I en bok. "Science, Nonscience and the Paranormal”, med olika författare har dr H. Narasimhaiah (f d Vicekanslor vid Bangalore University) ett kapitel om undersökningar av mirakler. definierar ett mirakel som ett fenomen som strider mot naturens kända lagar. Kommittén för undersökning av mirakler bildades 1976 och knöts till Bangalore University, varifrån den fick penningmedei. Antalet medlemtnar var elva. Från början klargjordes att kommitten inte var emot Gud eller någon religion. Kommittén började sin verksamhet med att undersöka påstådda materialisationer av föremål. Två swamier, som tillskrevs sådana krafter, förklarade öppet att de inte alls gjorde några mirakler. Men en "tonårsgud", Sri Bala Shiva Yogi, som dök upp i Bangalore, inbjöd dr Narasimhaiah att besöka honom. Under samtalet gjorde han nâgra rörelser med en hand under sin ockrafargade mantel och därefter plötsligt en rörelse med handen i luften och gav dr Narasimhaiah en liten bild och en "rudrakshi". Bamguden som misslyckades Dr Narasimhaiah berättar om barnguden som misslyckades. En sjuårig pojke med namnet Sai Krishna. vilken bodde i den lilla byn Pandavapura i närheten av Mysore, hade uppmärksammats i massmedia för sin påstådda förmåga att materialisera aska. Flera framstående personer hade besökt hans by. till Pandavapura som troende. men de skulle inte få tillåtelse att vidröra pojken eller undersöka honom på något sätt. Tre medlemmar av kommittén besökte Pandavapura torsdagen den 8 juli 1976 för att bevittna det torsdagsmirakel som brukade inträffa i samband med att bhajan (bön) hölls. Kommittémedlemmarna satte sig bland de troende, och avslöjade inte vilka de var. Den dagen inträffade inget mirakel. Följande torsdag korn samma medlemmar av kommittén ånyo till Pandavapura inkognito. Dr Narasimhaiah berättar att efter bhajan började de församlade människorna att skingras. Då upptäck te en av kommitténs medlemmar ett snöre som hängde ner från pojkens kropp. Hon drog i snöret och - aska, som hade dolts i pojkens underkläder, föll ut! Det blev en hel del uppståndelse. Kommitténs medlemmar anklagades och förbannades. Sai Krishna var alltså avslöjad. Det skapade sensation. Tidningar över hela lndien skrev om saken. Sedan Sai Krishna hade avslöjats, riktades kommitténs blickar helt naturligt mot Sai Baba, vilken tillskrcvs sådana mirakler som materialisation av klockor, gudabilder, guldkejdor och förvandling av vatten till bensin och botande av många obotligt sjuka. Sai Baba anses av sina troende vara en gud eller gudamånniska. Han är nationellt och internationellt känd för sina mirakler. Bland hans lärjungar finns många med höga poster i samhället och några välkända vetenskapsmän. Dr Narasimhaiah skrev tre brev till Sai Baba med bergäran att få göra en undersökning av hans mirakler. "Den karisma som uppstått kring er person bygger på tron att ni kan utföra mirakler. Ni vet att så snart era mirakler bevisas vara en myt, blir ni en vanlig människa. Därför är tydligen det bästa ni logiskt sett har kunnat göra att undvika allt som kan avlägsna den glorian." Dr Narasimhaiah skrev också i brevet att det inte är svårt att missleda eller lura många människor men att ingen kan lura sitt eget samvete. Eftersom inget av de tre breven till Sai Baba besvarades, vände sig dr Narasimhaiah till pressen och avslöjade brevens innehåll. Det blev en omfattande debatt i indiska tidningar och tidskrifter. Många tidningar intervjuade både dr Narasimhaiah och Sai Baba. Sai Baba öste - skriver Narasimhaiah - förakt och gift över honom, frågasatte hans kompetens att undersöka honom och betecknade honom som en värdelös, obetydlig stackare, som var oförmögen att fatta hans (Sai Babas) gudomliga krafter. I ett tal kallade Sai Baba medlemmar av undersökningskommittén för småkryp. Sig själv jämförde han med en stjärna och en oändüg ocean. Han riktade anklagelser mot Bangalore University och uppmanade dem att inte lägga sig i vad som inte angick dem. Han förklarade att det inte fanns någon på jorden som hade kapacitet att undersöka honom. Dr Narasimhaiah upplyser att det skrevs en rad artiklar i tidningar och tidskrifter till Sai Babas försvar, men han nämner ingenting om vad de innehöll, mer än att de prisade Sai Baba som Gud och tillskrev honom alla slags gudomliga krafter. Ytterligare ett brev sändes till Sai Baba. Han inbjöds att hålla en föreläsning om "mirakler", med demonstration, vid Bangalore University. Inte heller detta brev besvarades. Till sist beslöt kommittén att skriva till honom och tala om att de tänkte träffa honom klockan 10 på förmiddagen den 29 maj 1977 i hans bostad. Alla medlemmarna i kommittén samt representanter för pressen satte sig i en buss och åkte till Whitefield, där Sai Baba bodde. När de kommit fram hindrades de av vakter att komma in på Sai Babas område. De fick återvända med oförrättat ärende. Dr Narasimhaiah skrev att striden om Sai Babas trovärdighet pågick i nästan arton månader och fick många att börja tänka. Frön av tvivel såddes även bland Sai Babas närmaste lärjungar. Sai Babas inflytande har nu minskat; han har nästan upphört att utföra "mirakler" och dragit sig tillbaka, skriver dr Narasimhaiah. Att de sista uttalandena inte gäller idag är uppenbart. Sai Baba har gått oskadd genom striden med undersökningskommitten för tolv år sedan. Hur det har gått för kommittén känner jag inte till. Dr Narasimhaiahs rapport säger egentligen ingenting. Sai Baba har vägrat låta sig undersökas. Det kan bero på en naturlig misstro mot kommittén eller mot vetenskapsmän eller på att han har något att dölja. Fältet är fritt för gissningar. Men Erlendur Haraldssons publicerade studier - se Sökaren nr 8, 1987 måste anses väga tyngre än den indiska kommitténs dispyt med Sai Baba. Jag har också läst en artikel om Sai Baba i Anthropological Quarterly 53(3) 1983. Författaren, som heter Lawrence A Babb, understryker hur stor betydelse Sai Babas mirakler har för denne. Sai Baba är känd framför allt som mirakelman. Miraklema har en helt avgörande betydelse for kulten kring honom. Utan dem vore han inte stor. Hans lära är allmän indisk religiös förkunnelse, utan originalitet. 1. Utgivare är The Bangalore Science Forum, The National College Buildings, Bangalore, 560004 India. Jag vet inte när boken utkom, eftersom jag endast har fotokopior på några sidor ur den. Unfortunately Professor Haraldsson was unable at that time to find or interview those who had in the past denied that Sai Baba was genuine, including the elder brother who lived in Puttaparthi, and person who had seen Sai Baba drop a magicians implement for palming small objects while he was in Mangalore where he was taken ill with appendicitis. He could not known that one of Sai Baba's very closest servitors for decades, Colonel Joga Rao, was known within the circle of Indian residents at the ashram NOT to believe in Sai Baba miracles at all. Joga Rao was the ashram engineer and also conducted most of the picnic where Sai Baba drew forth objects from the sand (claiming to have materialized them) at places found by Joga Rao himself. Further, Joga Rao was for many years the person who daily prepared the two rooms in which interview groups were brought to observe most of Sai Baba's supposed 'manifestations' and further, he was the servitor who walked behind Sai Baba at darsan for years until around 1985, taking over letters which Sai Baba collected and thus having every opportunity to pass vibuti or other object to him without it being noticed. There were many other reasons why Haraldsson's investigation overlooked or simply failed to observe properly. Haraldsson never though of many ways in which the fraud could have been - and as widely reported since 2000 - was in fact carried out... the provision of objects for supposed 'materialization' by a know certain inconspicuous person who came regularly from outside into the temple. Even visiting groups, such as one from UK which donated watches and other objects later seen to be 'taken from thin air' in the interview room and studied afterwards to confirm that they were the same as donated earlier. Students have reported how they found rings, necklaces, trinkets and watches stored in a private box in the inner interview room and in his rooms as Kodaikanal, while others have seen a store of these trinkets under the cushion behind Sai Baba (exposed while he was in the private interview room). Numerous other proofs of sleight-of-hand and fraud have emerged, particularly after the many sexual allegations against Sai Baba and testimonies appeared on the Internet after 1999 (when the formerly much privileged and widely revered devotee David Bailey first leveled a major set of accusations against Sai Baba). Unfortunately, Haraldsson has never set the record straight by investigating these undeniable proofs of fraud and much besides.